This Daily Doodle illustrates the anatomical position of the left kidney, which is located approximately 1 cm higher than the right kidney. I originally intended to illustrate the surface anatomy, however I did not want to subdue the colors by adding a layer of skin over-top. 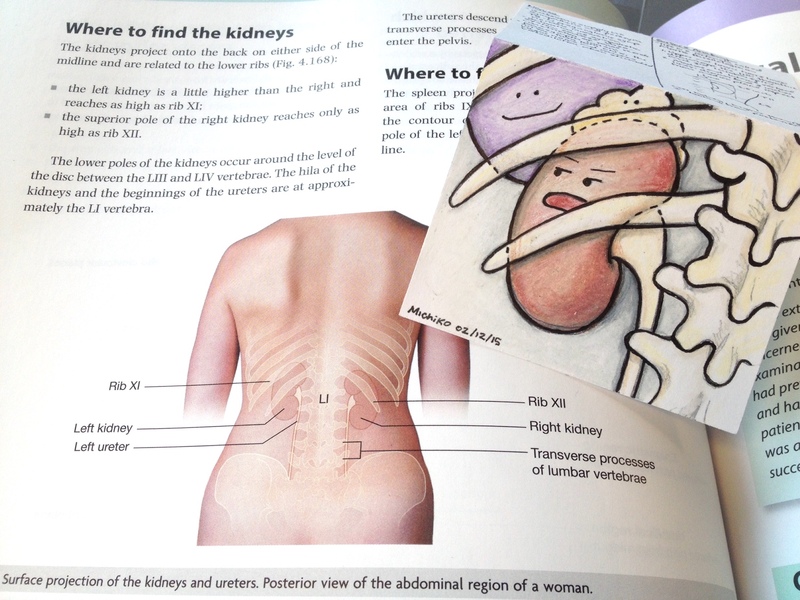 Anyways, the exciting point that I want to make is just how high in the body the kidneys are positioned. I found that many people think that their kidneys are somewhere down in their abdomen. They are actually partially hiding under the rib cage, just like this suspicious looking kidney peaking through the ribs as if it were a fence. To note, the anatomical position of the kidney might vary and some people might in fact have a kidney hidden in the abdomen or another variation, however, most kidneys are located in this general vicinity. The kidneys are paired retroperitoneal structures that are located on either side of the midline. The left kidney can reach as high as rib XI while the right reaches only rib XII. 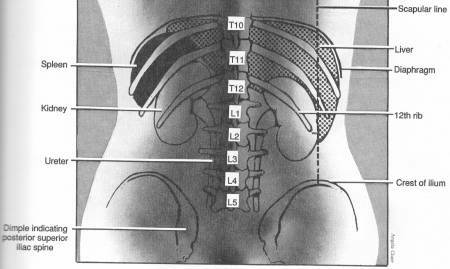 The lower poles reach to L3/L4 vertebrae and the hila of the kidneys is around T12/L1 . They are literally the shape of kidney beans and they are approximately 10-12cm in length and 5-7cm in width and 2-3 cm thick. They weigh about 150 g in males and 135 g in females . 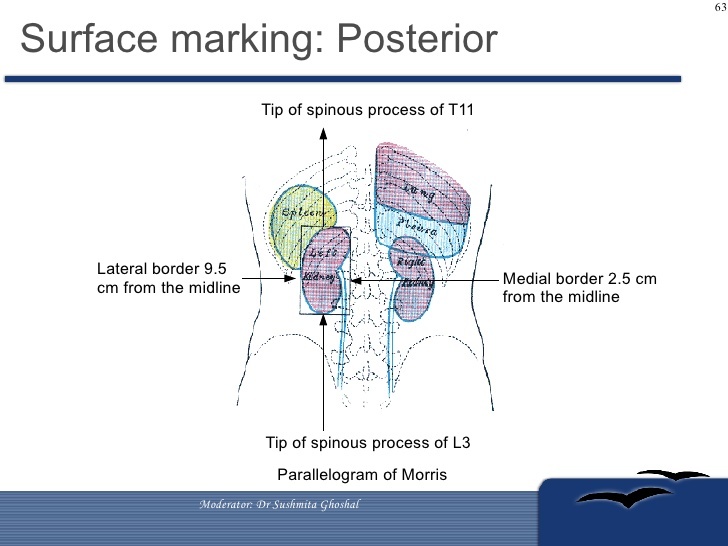 From the back, the kidneys can be located using the “Parallelogram of Morris” which involves drawing two vertical lines, the first 2.5 cm from the middle of the spine and the second 9.5 cm. Then draw two horizontal lines, one from the top of the spinous process of the eleventh thoracic vertebrae and the second line from the spinous process of the third lumbar vertebrae. The kidneys will likely be hiding in that area. So please don’t be surprised the next time a doctor taps on your back when they are examining your kidneys because, yes, that’s where they are typically located. This “tapping” test is called the “Costrovertebral Angle Tenderness” or “Murphy’s Punch Sign”. This test, if positive, elicits pain by percussion over the costovertebral angle, the angle made by the vertebral column and the coastal margin as seen in the doodle. If positive, there is high suspicion of an infection of the kidney such as pyelonephritis (click here to see the acute pylonephritis doodle). However, always keep in mind the entire clinical picture and the other possibilities on your differential diagnosis list such as perinephrtic abscess, renal stone, inflammation of tissue in the area… the list goes on. Clinically Oriented Anatomy 3rd Ed. Figure 2-86 p. 213. Surface anatomy and markings on the back of a 21-year-old woman. Which kidney is slightly higher than the other? How much higher? How big are the kidneys (length, width and thickness)? What organ is sitting on-top of the left kidney as seen in the doodle? Are the kidneys intraperitoneal or retroperitoneal structures? In relationship to the spine, what range of vertebrae do the kidneys span across? What does Costrovertebral Angle Tenderness suggest?